If you are new on the application and if you would like to write to him, you will able to contact your friend by his or her name. You can find your friends on your iOS and Android devices, if you have already added them to your contact. If you don’t see anyone’s name on the application, it means you have a trouble with the permissions. We recommend everyone to allow WhatsApp access their contact list. Otherwise you won’t able to use the application for chatting with your friends. Let’s begin to mention about how to find people on your contact by their name. To find a contact on WhatsApp by name, you will need to do steps below If you are using Android, please swipe/scroll down. 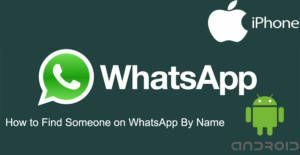 1-) Run WhatsApp Messenger on your iPhone. 2-) Go to “Chats” from the bottom menu of the application. 3-) Tap on “New Chat” icon. 4-) You will see the search bar at the top of the application, tap on search bar. 5-) Type individual name that you are looking for. If she/he is at your contacts, you will able to chat. You will need to do following to find a contact on Android. 2-) Tap on “Start New Chat” icon which is located at the bottom right of the app. 3-) Tap on “Search” icon. You can see the location of the search icon at the picture below. 4-) Type the name of the individual that you want to talk. If it he/she is in contact list of the phone, the name will appear. If your problem is still going on, you can leave a comment below and give more detailed information on your problem. We are going to respond you as soon as possible.